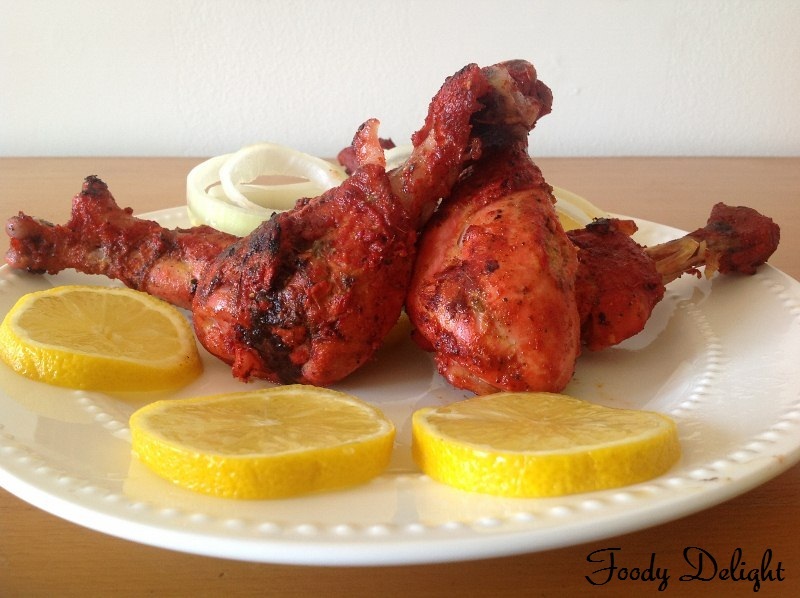 Today I am here to share one of the most loved dish of Indian cuisine "Tandoori chicken". This popular dish consisting of roasted chicken prepared with yogurt and Indian spices. 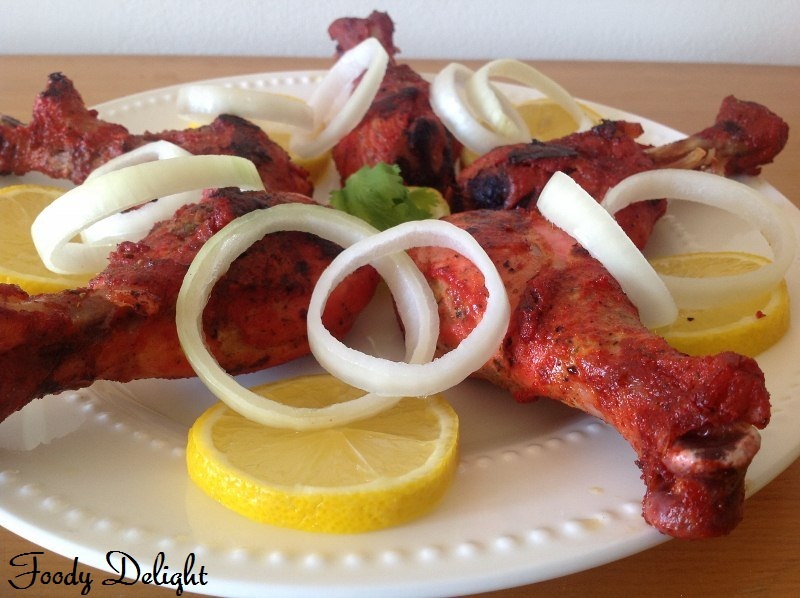 Tandoori chicken is traditionally cooked into a barrel shaped clay oven known as Tandoor.But the best substitute I found is the conventional oven,which gives a great result in cooking this dish. Wash the chicken drumsticks and dry them using kitchen towels. Using the knife make the cuts on thick flesh of the chicken drumsticks. For marination, take one bowl, add red chilly powder, salt and lemon juice. Mix all the ingredients and make the paste . Apply this paste on the chicken drumsticks and also fill the chicken cuts. Keep the chicken drumsticks aside for about 30 minutes. For tandoori masala,take the another bowl ,add yogurt, ginger paste ,garlic paste ,red chilly powder, garam masala powder ,tumeric powder ,cumin powder ,coriander powder, black pepper powder, crushed kasoori methi,salt and lemon juice. Mix all the ingredients well and make a thick tandoori paste. 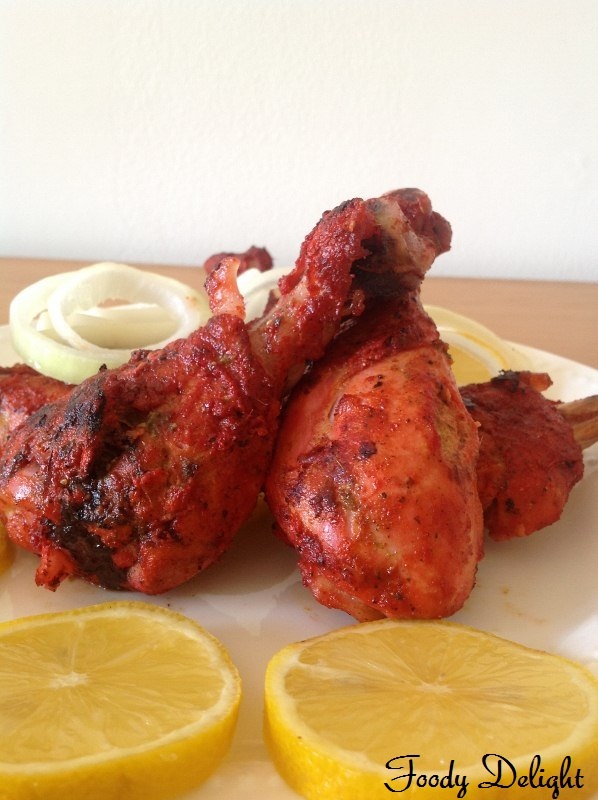 If using food colour, first dilute the colour into 1 tsp of water and then add into the tandoori masala. Add the marinated chicken drumsticks into the tandoori paste and mix well. Then add 2 tsp of oil and mix well,so that the masala nicely coats the chicken drumsticks. Marinate the chicken drumsticks for about 2 hours. After 30 minutes,check the chicken drumsticks and turn it and again bake for about 15 minutes. Parallely heat up the skillet. Then take out the chicken drumsticks from the tray and keep them into the skillet. Fry them on medium flame. Sprinkle some chaat masala. Take them on to the plate and serve hot with onion and lemon wedges. Use the thick yogurt for marination. If you find yogurt is watery,then tie the yogurt into muslin cloth and hang it overnight. Marinating the chicken for longer hours gives a better result. It looks fantastic, I 've never tried to make it but I think I will! thanks for sharing! 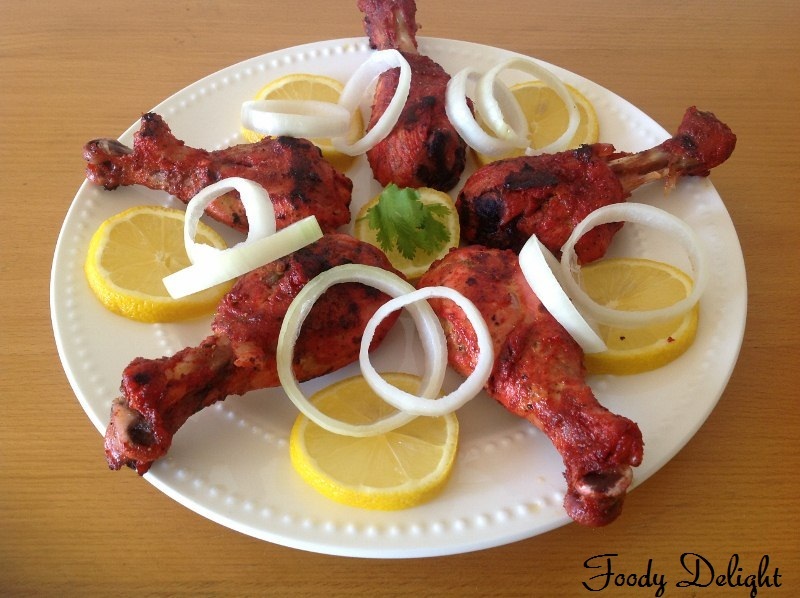 thank you for showing us how to do tandoori using oven!!!!! Thanks for visiting my blog..your blog is looking very nice,perfect and neat presentation....Chicken drumstick looks yummy...mouthwatering.. omg!!! !looks perfectly grilled! have to try this one out! What a nice delucious, juicy platter of chicken.yyyyyuuuuuuuuuummmmmmmmm.